Abstract: Lakatos’ sent his “Proofs and Refutations” to leading and famous scholars of the time, soliciting their comments. The comments were mainly expressed in private letters to Lakatos. After recalling the main message of the “Proofs and Refutations”, the talk presents excerpts from these letters, most of which are still unpublished, and can be found in the Lakatos Papers of the Library of the London School of Economics. 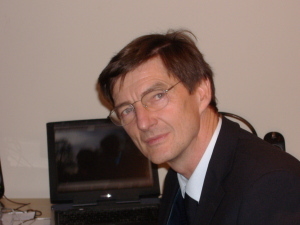 Miklos Redei (London School of Economics) specialises in the foundational and philosophical problems of modern physics, especially quantum mechanics and quantum field theory, quantum logic, and theories of probablistic causation. In 2013, along with Gábor Hofer-Szabó and László E. Szabó, he published The Principle of the Common Cause. This book gives a technically detailed analysis of the common cause principle: the claim that every correlation is either due to a direct causal effect linking the correlated entities or is brought about by a third factor, a so-called common cause. Another of his interests concerns John von Neumann and his work on the foundations of physics. As well as co-editing John von Neumann and the Foundations of Quantum Physics, he has edited a collection of von Neumann’s letters for the American Mathematical Society’s John von Neumann: Selected Letters. This entry was posted in Uncategorized on December 12, 2015 by Institute for Research in the Humanities.